After two years of negotiations the Principles of Responsible Investment in Agriculture and Food Systems (PRIAF) were approved by the Committee on World Food Security (CFS) on October 15, 2014. This has been endorsed by some as a breakthrough for realising the right to adequate food and ensuring food security for all. Since the 2007/2008 global economic crisis, agricultural investments, particularly large scale investments have flourished across the globe. Africa has become a major destination for large scale agriculture investors largely due to the cheap and fertile land, and poor protection of land rights. The investments are apparatuses of the market led agricultural trade liberalization model claimed to be the panacea for food insecurity in the world by hegemonic industrialized states. It is evident that some of these investments have utterly affected the right to adequate food in Africa and elsewhere as the investments, for instance, displaced people from their land, or registered futile contribution to food security and nutrition. For this reason some practitioners proposed human rights based regulation of global and national food and nutrition related policies. Nevertheless the investors and host nations defended the investments and denied the adverse effects. The PRIAF was born out of these competing views on agricultural investments. It brought together major stakeholders to come into consensus on common principles on how to conduct agriculture investments. It is an effort to regulate agriculture investments globally; and to strike a balance between investment promotion and protection of human rights and ensuring sustainable development. The disengagement between investment agreements and human rights is troublesome. A country may receive huge investments but these may not bring wide ranging socio economic benefits to the people. Investments need to respect and promote human rights so as to achieve inclusive and sustainable development. But researches suggest that, the right to adequate food is arguably the most consistently violated human right. The PRIAF is generally a reflection of the major international human rights instruments encompassing the right to adequate food. The intention is to promote responsible investment in agriculture and food systems and thereby support the progressive realization of the right to adequate food. The PRIAF has ten key principles that deal with all types of investment in agriculture and food systems including public, private, large and small scale. The principles depict the four key dimensions of food security namely- availability, access, utilization and stability. The principles consider all the four dimensions as equally essential. It recognize the existing international and national legal frameworks, including the 1948 Universal declaration of Human rights, the Voluntary Guidelines on the Progressive Realization of the Right to Adequate Food in the Context of National Food Security, and the 2007 United Nations Declaration on the Rights of Indigenous Peoples. Principle 1 requires agriculture investments to contribute to food security and nutrition to enhance the progressive realization of the right to adequate food. Principle 2 illustrate sustainable and inclusive economic development and the eradication of poverty through respecting ILO conventions, and taking actions, such as creating jobs and promoting rural development. Gender Equality and women’s empowerment are also central to the PRIAF (Principles 3). Ensuring equal access, especially for women to productive resources is critical to eradicate poverty. The principles promote human rights- in particular to safeguard people against dispossession of legitimate tenure rights. They call on stakeholders to respects legitimate tenure rights to land, fisheries, and forests, as well as existing and potential water uses (Principle 5). Unfortunately none of the principles explicitly recognize the landless farmers, while lack of ownership of production means is the root cause of deprivation and chronic hunger in many countries. Principle 9 underlines the significance of involving people, whose right are directly affected by the investments, in decision making. It precisely refers to indigenous peoples’ free, prior and informed consent as per the United Nations Declaration of Rights of Indigenous Peoples. Paragraph III of the PRIAF outlines the role of various stakeholders such as, the private sector, civil society organizations, UN agencies, and development banks. The primary responsibility lies with states. States have responsibility to fulfill their obligations under international law for the realization of the right to adequate food. Besides, the PRIAF describes the role of other stakeholders, for example, Intergovernmental and regional organizations and financial institutions. It encourages financing and donor institutions and funding entities to use the principles when extending loans and investing in agriculture. Financial institutions such as, the World Bank have funded investments that affected people. These institutions should not just be invited to apply the principles; they need to be legally responsible for the funds they extend when the investments violate human rights. Further, the PRIAF embraces other fundamental human right principles such as transparency and accountability. Although the PRIAF embody the key ingredients of the right to adequate food, they are voluntary and non- binding thus do not to impose legal obligation on the stakeholders. The member parties nonetheless may to some degree expect adherence. Sufficient evidence exists in the field of international environmental law that voluntary agreements though without specific binding force are an effective means of building international consensus on specific issues. For instance they offer an avenue to put diplomatic pressure on member parties and establish common institutions. States can also use economic incentives in the form of technical assistance or technology transfer to encourage compliance with PRIAF. These kinds of incentives have been effectively used in International Environmental agreements such as, Montreal protocol and RIO Bargain. In a nutshell, the approval of the PRIAF is a small step forward to reinforce food security efforts. Yet the dearth of ‘political will’ impedes the full realisation of the right to adequate food. 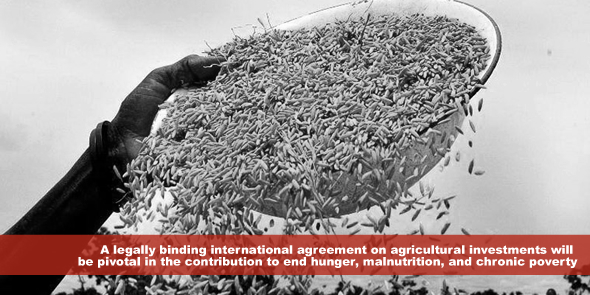 A legally binding international agreement on agricultural investments is desirable. And when that happens, global agriculture investments will have a considerable contribution to end hunger, malnutrition, and chronic poverty. Bereket Kefyalew is a graduate with MSC in International Relations and Development from Aalborg University, Denmark. The author also holds a Bachelor Degree in Laws (LLB) from Mekelle University, Ethiopia. He has taught at the Hawassa University, Ethiopia and worked in other Organizations in Denmark. Currently, he is a freelance consultant and researcher in human rights and development.